Erica Hermonot sighed at the memory. Three years ago, she and her husband took over the day-to-day management of the herd at Fairholm Farm, which her family had founded nearly a century earlier, and her days were consumed with the challenges of keeping a small dairy operation afloat. The family was trying to grow Fairholm because data suggest that getting to 400 or so milking cows gives independent farms an economy of scale that can result in higher profits. So when a neighbor had showed up to say that he’d finally had enough of the extraordinarily long hours and tight margins of the dairy business, and, like farmers across the country, was going to sell his cows, the family decided on the spot to buy his entire herd. “We are now also renting his farm, which is about five minutes down the road,” Hermonot told White, the Amelia Peabody Professor of Agricultural Sciences. White was aware that the neighboring farm was shutting down because he’d been the regular vet there for 19 years. When he asked Hermonot what she was going to do with the property she had rented on the farm, she said she planned to house her weaned calves in two buildings there. Hermonot’s face flashed with frustration. She’d known White since she was 12, when he first started working with her family’s farm as part of the Tufts Ambulatory Service. Things could occasionally get testy—especially with the stakes for farmers getting so high over the years. Dairy farming, never an easy life, had become more challenging than ever. Seven years ago, when Hermonot first returned to manage the cattle on the farm that her great-grandparents had founded, milk prices were at an all-time low. Across the country, dairy farms were spending more to produce their milk than they were being paid for it. Granaries were shutting off feed deliveries. Milking herds were being auctioned off for beef. The U.S. Department of Agriculture even started promoting a national suicide hotline to dairy farmers. Fairholm managed to weather that storm, but many other farms did not. The number of milking cows in Connecticut has been stable for some years, but the number of dairies continues to shrink as the industry consolidates. In 1965 Connecticut had 1,600 dairy farms. Today it has 120. Those that remain must innovate and grow, or, like Hermonot’s neighbor, simply shut down. Few of her friends understood that special teenage indignity of getting splattered with manure while mucking out the barns each day after school. 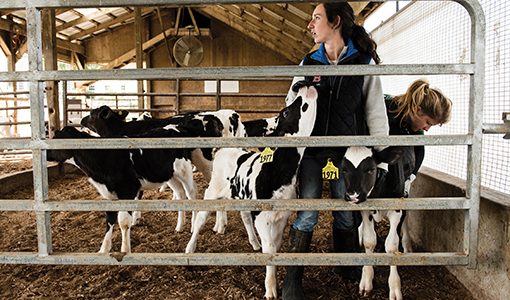 Tufts has long recognized the struggles that dairy farmers face, both in New England and nationwide. In 1980, the university established its ambulatory service to help address a shortage of food-animal veterinarians by creating a practice based in Woodstock that would travel up to two hours away for farm visits. The idea was to help farmers and also provide the next generation of vets with hands-on experience caring for livestock. The staff has since quadrupled, and today nine large-animal veterinarians, accompanied by fourth-year Cummings students, make about 4,000 calls each year to farms all over Connecticut, Massachusetts and Rhode Island. Together, the vets tend to more than 35,000 cattle (most of them dairy cows, but some raised for beef), 2,000 horses, 700 sheep, 700 goats and 800 alpacas and llamas. White regularly visits about 15 dairies, most of which he’s worked with for nearly 20 years. He travels to each farm once or twice a month to check on the health of the herd and to help keep the milk flowing by confirming which cows are pregnant and which need to be bred. He also acts as another set of eyes for the farmers, looking for potential problems, such as cramped cattle housing, nutritional deficits in the feed or improper milking technique—and as his exchange with Hermonot demonstrated, he can be blunt about what needs to be improved. Hermonot’s great-grandparents, Ethel and Estella Barrett, bought Fairholm in 1920 for $14,000, a good value for a farm of its size—100 acres back then, with a handful of cows and some equipment. The word “farmer” often evokes the image of a strong, independent man in coveralls, but ever since Fairholm came into Erica Hermonot’s family, the driving force behind the farm has been women. Estella Barrett was quite a businesswoman, recalled Erica Hermonot’s mother, Diane Morin. “My grandmother was born on a farm across town,” Morin said. “She was a Wellesley graduate, which was pretty amazing in the early 1900s.” Under Estella’s stewardship, the farm produced cottage cheese and yogurt, in addition to milk, to bring in extra money during the Great Depression. As anyone familiar with James Herriot’s All Creatures Great and Small could guess, White has spent plenty of time at Fairholm armpit-deep in cows dealing with pregnancy issues. But in the time since he graduated from veterinary school, technology and information have transformed the dairy farm, much as they have the rest of modern life. “When I graduated from veterinary school 20 years ago, if I could run a bottle of calcium through a cow to treat milk fever, trim a foot and diagnose a pregnancy, I was really valuable to a dairy,” he said. “But that skill set doesn’t cut it today.” These days, White and the other Cummings School vets analyze reams of data on each farm’s milk quality, production volumes, and rates of pregnancy, lameness and infection. They help keep farmers abreast of best practices by explaining how their operations compare with top performers across the country. “If we can keep farmers up-to-date on new vaccination and breeding programs and the latest technologies,” said White, “they have a chance to at least control what it costs to produce the milk, if not what they receive for it.” In a 2014 analysis for Fairholm, for example, White calculated that if the farm could regularly ensure that 25 out of 100 eligible cows became pregnant, it could realize an extra $134 per animal, or nearly $32,000. That extra sliver of profit from being a little more efficient at producing milk is what might allow a farmer to spend more time with family by hiring another worker or adding robotic milkers. It could mean being able to build a better barn, transition the farm to the next generation or just take a vacation for the first time. Just two days after graduating from the University of Wisconsin in 2007, Hermonot returned to work alongside her parents at Fairholm. Things got off to a good start, with the Morins putting a plan in place to slowly transition ownership of the dairy to Hermonot over the next 30 years by gifting shares of a small-business corporation that was created after Morin’s father died. It wasn’t long, though, until Hermonot encountered her first serious problem as a professional farmer. In 2009, dairy prices hit an all-time low, and dairy farms across the country were losing as much as $200 every month for each cow they owned. Hermonot was 24 and “on fire,” White recalled. Her patience ran short and her temper often flared. “The combination of long hours and guilt made for a very difficult year for me personally,” admitted Hermonot. “I struggled with the regret that I had put my parents in a situation that they may have handled much differently if I had not decided to come home.” Eventually, Fairholm managed to ride out the crisis, even as many dairies in Wisconsin, California and Vermont went under. Besides their own hard work, it was their low overhead that kept them afloat. For decades the farm had gotten by without making extensive capital investments, a frugal approach that allowed them to withstand the dramatic fall in milk prices. The young couple has since taken over day-to-day management of the cattle, while Diane Morin handles the books and Todd Morin oversees the grass and corn crops used to feed the cows. The family has been growing Fairholm’s milking herd—with the recent purchase of their neighbor’s cattle, they now have about 450 cows—and making significant capital improvements. They have built four new barns in the last five years (and White just reviewed their building plans for another new barn), and they’ve invested $25,000 in high-tech cow collars that let them monitor the animals’ activity remotely to catch their best breeding times. The hard work and innovation are paying off. Today, the Hermonots and Morins work the farm alongside a staff of six employees (including Erica’s younger sister), and truck about 3,300 gallons of milk each day to Garelick Farms in Franklin, Massachusetts. Last year, the Morins traveled to Key West, Florida, for their first-ever non-working vacation.